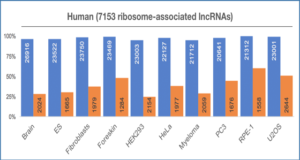 The human transcriptome comprises a myriad of non protein-coding RNA species, including long noncoding RNAs (lncRNAs), which have a remarkable role in transcriptional and epigenetic regulation. 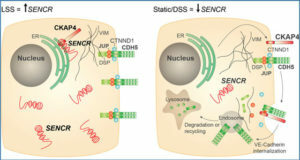 Researchers at the University of Buenos Aires hypothesized that variants in lncRNAs influence the susceptibility to nonalcoholic fatty liver disease (NAFLD). Using next generation sequencing, they performed a survey of genetic variation associated with randomly selected lncRNA-genomic regions located within both experimentally validated and computationally predicted regulatory elements. They used a two-stage (exploratory, n = 96 and replication, n = 390) case-control approach that included well-characterized patients with NAFLD diagnosed by liver biopsy. They sequenced > 263 megabase pairs at quality score > Q17, in a total of 2,027,565 reads, including 170 lncRNA-genomic regions. In the sequencing analysis and the validated dataset, they found that the rs2829145 A/G located in a lncRNA (lnc-JAM2-6) was associated with NAFLD and the disease severity. 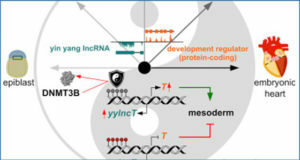 Prediction of regulatory elements in lnc-JAM2-6 showed potential sequence-specific binding motifs of oncogenes MAFK and JUND, and the transcription factor CEBPB that is involved in inflammatory response. The A-allele was significantly associated with NAFLD as disease trait and the disease severity (NASH-nonalcoholic steatohepatitis vs. controls. The A-allele carriers also have significantly higher body mass index and glucose-related traits compared with homozygous GG. 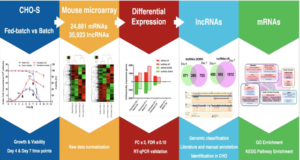 Hence, these results suggest that variation in lncRNAs contributes to NAFLD severity, while pointing toward the complexity of the genetic component of NAFLD, which involves still unexplored regulatory regions of the genome. 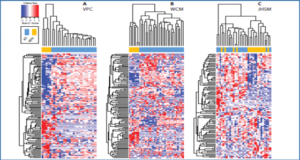 The graph represents a heat-map of predicted targets aggregated in co-expression clusters and ranked according to their biological function based on KEGG (Kyoto Encyclopaedia of Genes and Genomes) pathways or Gene Ontology (GO) analysis. KEGG pathways are identified by a combination of a letter code (hsa) and 5 digit number; GO terms are identified by a code of 7 digit numbers. Results are expressed as R-squared [R2]; p values stand for significance of the enrichment scores expressed as nominal P-values < 0.01 and a false discovery rate (FDR) < 0.25. 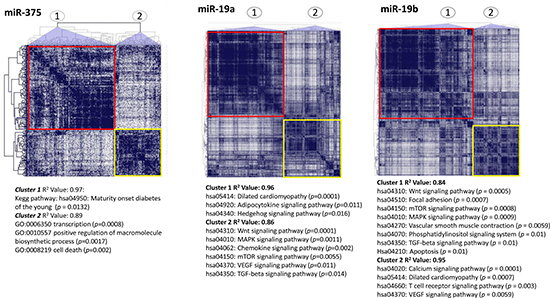 Predicted targets of miR-375 consist of a list of 634 genes, 317 of which falling within the first 50th percentile. Predicted targets of miR-19a and 19b consist of a list of 3577 and 3320 genes, respectively; 1789 and 1660 of which falling within the first 50th percentile, respectively. Predictions were performed by the program CoMeTa (Co-expression Meta-analysis of miRNA Target genes), available at the web site http://cometa.tigem.it.